If you have cable please watch Fashion Hunters for me tonight at 10:30pm/9:30c on Bravo TV. Fashion Hunters is about the Second Time Around consignment shop in Manhattan on the Upper East Side. 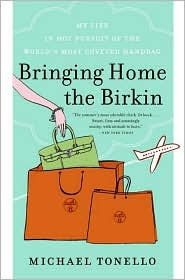 When I saw on Twitter that Michael Tonello, author of one of my favorite fashion books, Bringing Home the Birkin, will be a guest on the show I instantly linked to Bravo to see the preview and this episode looks like a good one. The sellers at Second Time Around invite a number of Hermès Birkin and Kelly owners to a party, I’m assuming to see if anyone is interested in selling their bag, and Michael tells Ambria, the Assistant Manager, that one of the Birkins brought to the party is a fake! It’s no secret I am a huge Hermès fan and a Birkin or a Kelly (probably vintage) is at the top of my wish list. After reading Michael’s book about his stint as a Birkin reseller, I know he is an expert on all things Hermès, especially the bags, so tune in to Fashion Hunters to have him show you exactly how to spot a fake. If the lady with the faux Birkin paid real money for that bag, stand by for the fireworks and the tears, the cuss words and the denial! Fashion Hunters airs Tuesdays at 10:30pm/9:30c on Bravo TV. I sent up the DVR this morning to record the show tonight. It comes on too late for me to stay up and enjoy...but I plan to enjoy it tomorrow!! There are so many jobs I think I would enjoy and running a New York Consignment shop would be up near the top!! Oh my gosh - can you imagine paying for what you thought was the real thing and getting a fake? Man, sorry I missed that! Will have to look for a replay. Pam, did you see the show? What did you think? And what happened with the Birkins? Was there in fact a fake one in the bunch?! I would've loved to have seen this particular episode, I'm a big Michael Tonello fan. Hi Adrienne, I think I would have a complete heart attack if I paid serious money for a bag I thought was real, only to learn it was a fake. Which is one of the MANY reasons I probably won't ever own a Birkin. Maybe a Kelly, but it will be vintage, and I'd love to have Michael Tonello with me when I bought it to make sure it was real. And I'm prepping my Missoni post tonight! Vahni! I just went to your site. I cannot BELIEVE you are going to Barcelona! I am so excited for you! Your blog is just growing and growing and it's so fun to watch. I hope you enjoy every minute of your trip. Maybe catch this episode of 'Fashion Hunters' in the hotel on a replay? Michael Tonello is a bigger fraud than the fake bag he spotted. It didn't take much talent to see it was a fake. These people are in NYC where the foremost craftsman works at Hermes. Bags are sent there for work and Tonello should know that. A bag does not have to be sent to Paris for a simple polish and cleaning. Couldn't this show afford to get a real expert? He wasn't even up to date with the pricing. This guy is so out of the loop! His best selling book is on the $1 shelf at the bookstore. He spends his time stalking people and spreading rumors on his hate blog. A very poor choice for this show. The producers did not do their homework. Tonello is a has-been when it comes to Hermès. He slams the brand every chance he gets by posting lies about the stitching and other erroneous details on various discussion boards and blogs. Fashion Hunters is a really, really bad show and having Tonello on it didn't help. Google him and you'll see all the hateful things he has spewed about average people he doesn't even know because he was banned from a purse forum (!!!!) and he's been seeking revenge ever since! Michael Tonello showed that he is not knowledgeable about Hermes and was really not the right person for this assignment. First of all, he told the woman with the Kelly that it needed to go to Paris for a spa. There are several Hermès locations in the US that can perform that service. At the Madison Ave boutique, for example, there are Claude and Pierre who can do just about anything to a bag. Only when it needs something major, such as a new panel or handle does it need to go to Paris. The re-freshening needed on the Kelly in the show could easily be done in NYC. One can't help but wonder if he mentioned Paris instead of NYC because of his persona non grata status there. If the bag's owner would have brought the Kelly to the Madison Ave. boutique saying Michael Tonello told her to take it there, she would likely be looked upon with disdain. At least in Paris, they probably don't have a clue who he is. It was interesting to see Tonello put on his "charm" and be so nice to the ladies in attendance. The only side I've seen of him online is that of a bully who harrasses and makes fun of middle-aged and elderly women that he has never met in real life. He knows them from a Purse Forum, from which he was banned. He has posted their real names, cities and hateful doctored photos and spiteful remarks. These woman did nothing to him. They only posted on a forum from which he was banned. It's a good thing that Loren Ridinger wasn't at the Birkin party. He has ridiculed her, also. Wouldn't that have made for some interesting TV!